This is an advance call out for the next Nottingham Save Our Services demonstration! Following protests in town and at County Hall during the week of the Spending Review, we will assemble at the Forest Recreation Ground at 11.30am and then march to the Market Square in Nottingham at 12.30pm on Saturday 20th November where we will hold a rally.. The event is ‘Demonstration Against the Cuts’ and we say “There is an alternative. Make the rich pay for the crisis.” Hopefully this will give you time to make your own banners and placards. Lets make it as big & noisy as possible! Download leaflet advertising the demo. We call on all workers, benefits and pension recipients, community groups, charities, school and college students, to unite and show opposition to the cuts in our region. Campaigners from nearby areas are welcome to join. Download Flyer for Notts SOS 20th November 2010 Demonstration (A4 also suitable as poster). 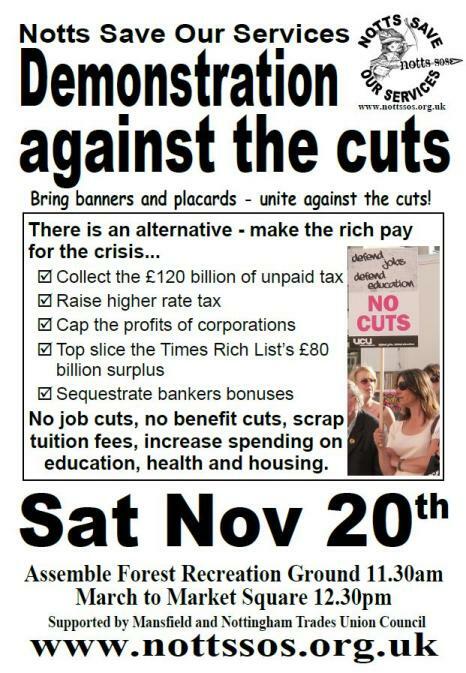 Alternative download Flyer for Notts SOS Nov 20th Demo – two A5 leaflets per page. Feel free to visit the Notts SOS stall in the Market Square this Saturday at 12 noon this weekend (6th Nov) and join the Clumber Street Vodaphone protest at 2pm if you can. From now until the demonstration we will be having stalls around the city and surburbs. We will also be meeting each Monday at the International Community Centre (YMCA Mansfield Road) from 7.30pm until 9.30pm. All welcome. This entry was posted in Campaign info, Events & meetings, Road to success and tagged city, cuts, demonstration, video. Bookmark the permalink.